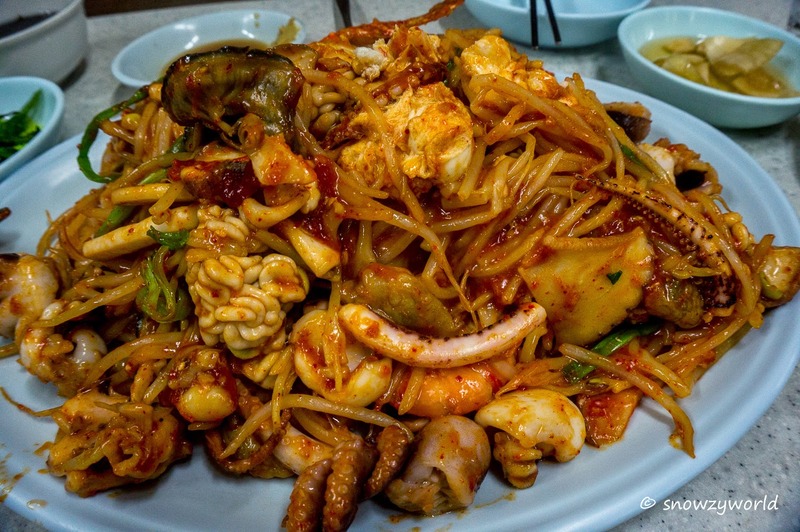 11 days of gluttony in South Korea. From breakfast, lunch, dinner daily to meal 1, meal 2 up to meal 5 or 6. This was how much we ate during the 11 days of the trip. However, there’s just too many type of food in South Korea, despite our 5 – 6 meals per day, we could only ate this much, guess not even 1/3 or it! Here are some of the memorable food we ate. 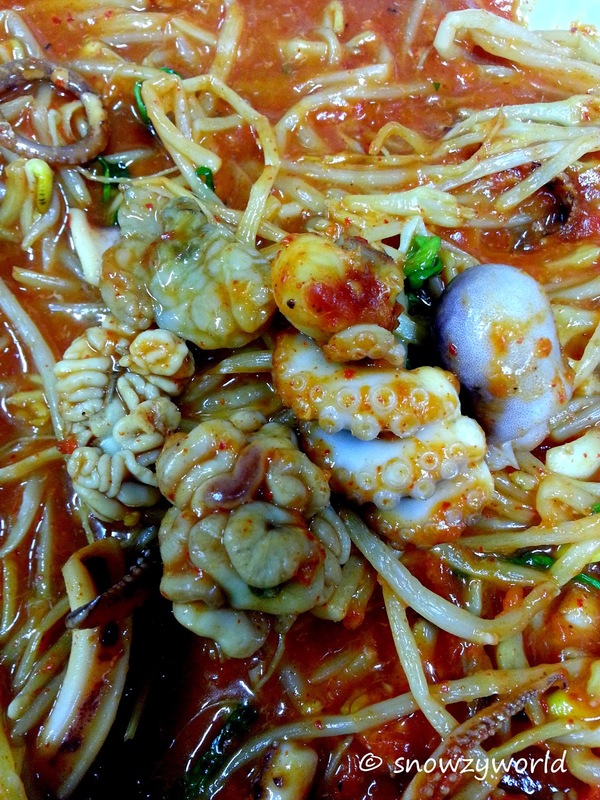 莫名其妙的海鲜？ Our first meal in Korea was this.. really, what’s this? The English menu said it’s seafood. The couple seated at the next table were eating it and it looked delicious. Looked spicy hot , could be great for this cold 1st night in Seoul. Not cheap thou – KRW44,000 (about SGD 50). The dish came with huge serving. Originally thought it’s noodles but it’s actually soybean sprouts. Abundance octopus, small pieces of crab meat and many many unknown stuff inside. Some looked brainy, some taste really yucky. What’s all those brain look-alike stuff?? Probably we were too adventurous… till now I still don’t know what’s the name of this dish. When you come to Korea, you just got to try this! Eating live small octopus! We randomly walked into this little restaurant at Gwangjung market where there’s a tank of octopus swimming. Ordered a small octopus at KRW15,000 (about SGD18). The little octopus was cut into small pieces, lightly seasoned with sesame oil and served immediately. Although cut into pieces, it was still moving! The suction cups on the arm pieces are still active thus care should be taken when eating. The active suction cups can cause swallowed pieces of arm to stick to the mouth or throat. It can be choking hazard if intoxicated. The guys decided that they should drink soju to intoxicate the octopus… blah~~ anyway after their 1st piece, both gave a thumb-up! The girls on seeing this, decided to try… Wow.. I must say it’s yummy! Maybe is the seasoning? but the octopus was chewy and sweet. I try to put it between my front teeth and kept biting and chewing it until it is really to be swallow. Not long, we finished the whole plate and the restaurant staff were all quite amazed. Haa.. It must be the yummiest stuff we ate in Korea! So yummy that we ordered another one despite the price.. KRW30,000 for one small crab. That’s how expensive it was. The meat was firm and sweet. At first I thought it will be very salty since it was dunk in the soy sauce for awhile, but no. The soy sauce actually added flavour and complement the sweetness of the crab meat. I did not eat the roe, but according to kakis who ate, they said it was heavenly! 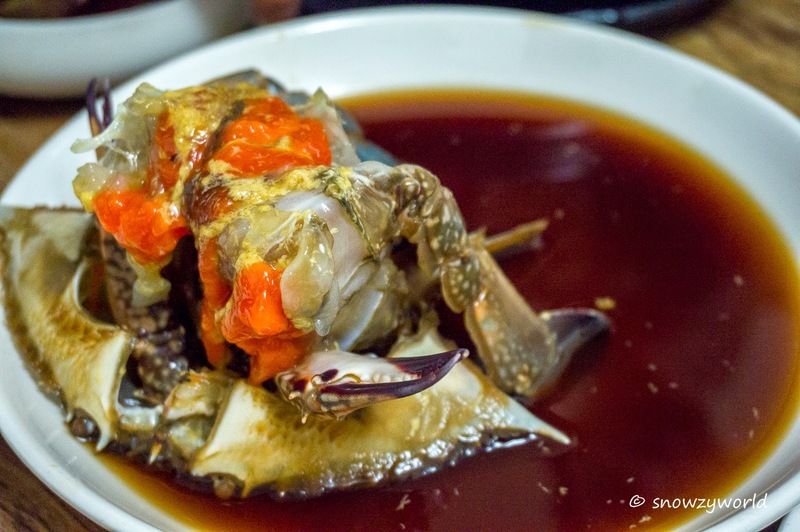 I read that the key to this cuisine is the marinade, it must be prepared just right so that it will not be too salty for consumption and yet strong enough for the blue crabs to ferment properly without strong odour. So that’s how complicated and so warrant this price tag. The right way of eating was actually to use the shell as plate, put a spoonful of rice, add the meat and roe, drizzle the soy sauce mixed it and eat… aaahhhh….. The one soup to drink in cold weather, although the Koreans believe in the saying “Fight heat with heat” which means eating boiling hot dishes in hot summer days as the nutrients in our body can easily be lost through excessive sweating and physical exertion during the hot summer..
A whole chicken is stuffed with glutinous rice, ginseng, and various ingredients and slow cooked for a long time. 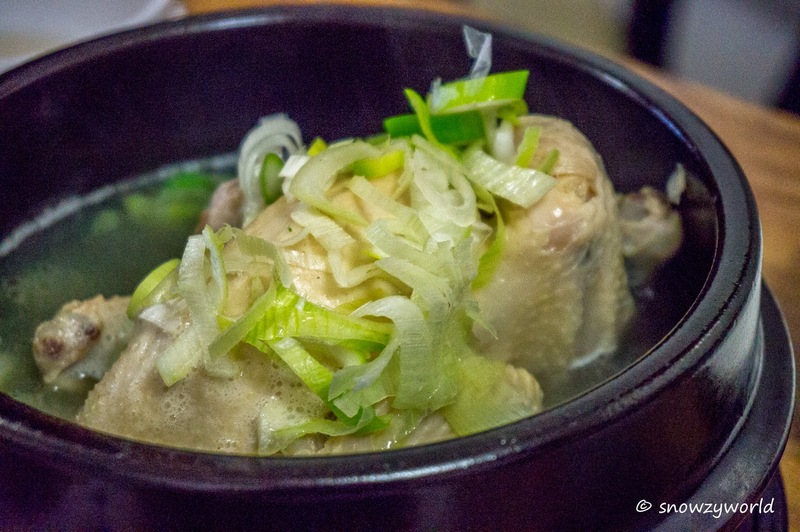 Like the chicken soup, which is considered to help common sickness, samgyetang is also known be cure physical ailments and prevent sickness as well.